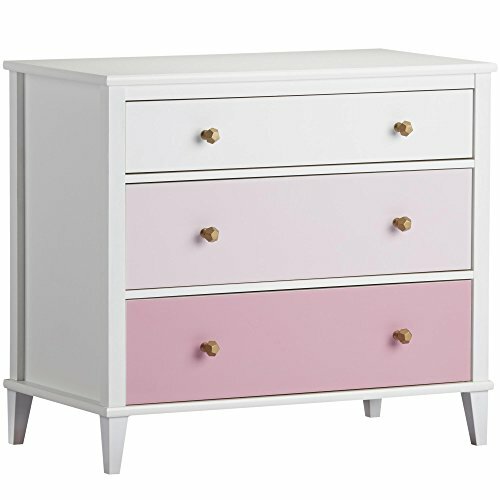 Graduated pink ombre-styled drawer fronts give this classically-styled dresser an updated look. Each drawer is fitted with metal slides and built-in stops designed for trouble-free use and easy-to-use wall anchors are included for household safety. Two sets of drawer knobs are included so you can customize the look of your dresser. Like all Little Seeds products, this purchase helps support a major environmental initiative. Discover how this can help you and your child involve your community in habitat rebuilding. Expand your collection by mixing and matching the Monarch Hill collection pieces to create a one-of-a-kind space for your child. The Monarch Hill Changing Table Topper (6819015COM) coordinates with this 3-Drawer Dresser for an added changing table surface. Stability tested to meet or exceed tip standards. Anti-tip kit included for extra protection. Customize this dresser by choosing from two sets of drawer knobs included.